Alter The Press! : All Time Low Release New Song "Nice2KnoU"
All Time Low Release New Song "Nice2KnoU"
All Time Low have released another song "Nice2KnoU" from their highly-anticipated album Last Young Renegade that drops June 2 via Fueled By Ramen. The video, which can be viewed below, was shot in a Baltimore bar that is owned by guitarist Jack Barakat. 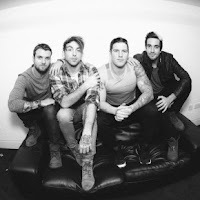 Dates for All Time Low's summer tour can be found here.